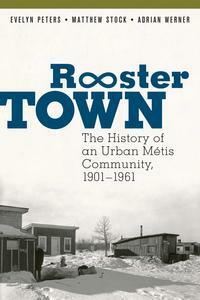 Rooster Town: The History of an Urban Métis Community, by Evelyn Peters, Adrian Werner and Matthew Stock, documents a history of Indigenous urban experience in the Métis community of Rooster Town on the outskirts of southwest Winnipeg. In this list, Peters shares other works that explore the important colonial history of First Nations and Métis communities within urban areas in Canada. In 1901, sixteen Métis households moved into southwest Winnipeg joining six Métis families who had moved there a few years before. They squatted on unserviced lots which had reverted to the City of Winnipeg for unpaid taxes. While the settlement contracted slightly during the Great Depression, Rooster Town grew every year until in 1946 the community reached its maximum size of 59 households, with an estimated population of more the 250 people. Poverty and unstable employment meant that squatting or buying inexpensive land on the city fringe, and self-building, was a resilient strategy for accessing urban employment and services and providing housing for families. Poverty and unstable employment meant that squatting or buying inexpensive land on the city fringe, and self-building, was a resilient strategy for accessing urban employment and services and providing housing for families. By 1951 the City of Winnipeg was eager to encourage suburban development. Social service departments had publicized Rooster Town poverty, and newspaper reporters from both of Winnipeg’s daily papers visited the community, took pictures of the poorest conditions, and published sensationalist articles that homogenized and humiliated residents, characterizing them as filthy, disease-ridden, and all dependent on social assistance. In fact, most Rooster Town heads of household were employed, most were able to provide better opportunities for their descendants, and many eventually moved into nearby suburbs. Surviving photos contradict stories of dirt and disease. But, by 1960, most Rooster Town residents had moved or had been forced to move, and the remaining houses were destroyed to make way for a shopping centre. The significance of this research goes beyond the history of this one community. The significance of this research goes beyond the history of this one community. While numerous urban Métis fringe communities formed on the prairies and in BC, there has been very little documentation of them in either Canadian urban or Métis history. While there is a growing body of research on the impacts of settler colonialism on First Nations people living in cities, there is virtually no work that focusses on Métis people. Exploring this colonial history contributes to our understanding of both urban and Métis histories. This article provides a summary of the main dimensions of Rooster Town’s history. Burley argues that the treatment of Rooster Town residents represents an example of municipal colonialism towards Aboriginal people. 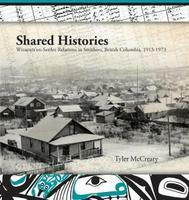 This is a history of the fringe settlement of Island Cache at the edge of Prince George, BC. The settlement began in the 1920s when a small group of settlers found residence on the island just outside the City of Prince George, separated from the City by a flood channel. By 1970 approximately 40 percent of residents were Métis, 20 percent were non-Status Indians, and most of the remaining families were immigrants. Viewed a slum and hazardous to the health of its residents, in 1970, the City began a series of initiatives to move community residents. By 1981 the community was completely gone. This study documents the struggle of Witsuwit’en families to build a place for themselves in Smithers, BC by establishing a community called Indiantown at the municipal fringe. It explores the contributions of those families to the northern economy, and the eventual destruction of the Indiantown community. The book helps recover often forgotten histories about the presence of Indigenous peoples in the development of early northern towns.